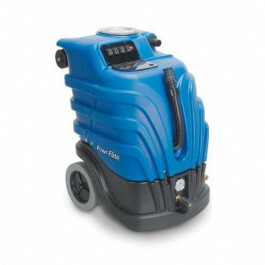 This heated steam cleaning extractor is made by Powr-Flite out of Fort Worth, Texas. They strive in providing powerful machinery at affordable prices. This adjustable pump extractor doesn't deter from those standards, it comes with two dual-stage vacuum motors that provide 150 inches of waterlift, and 97 CFM. The heater is 1700 watt internal heater that will heat the water in a reasonable amount of time to the perfect cleaning temperature. We have a few heated carpet cleaning machines that have external heaters that will not be put out of commission if the heater fails, like on this machine. This Powr-Flite heated extractor comes with a 20 foot solution/vacuum hose and an optional tall carpet drag wand that gives you a generous 12" wide cleaning path. 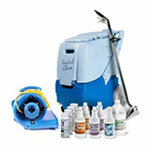 The drag wand has 2 jets for dispensing cleaning solution onto your carpet as you pull back the wand. 10 gallon solution & 8 gallon recovery tanks provide plenty of coverage. Demand bypass internally limited 50 - 200 adjustable PSI pump. Two 2-stage vac motors and 1700 watt heater power this machine. 150 inches of waterlift provide plenty of suction to dry carpets in a timely fashion. Durable housing with 5 year warranty guarantee a long lasting machine.